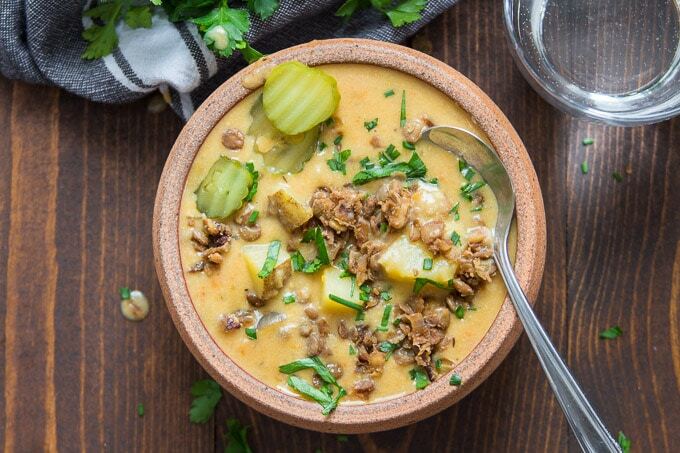 Creamy, cheesy vegan soup that actually tastes like cheeseburger! Sounds strange, but tastes amazing. 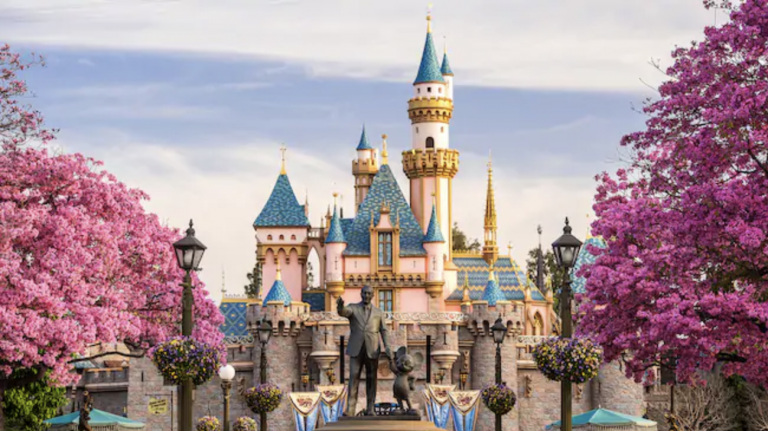 You’ve got to try it to believe it! 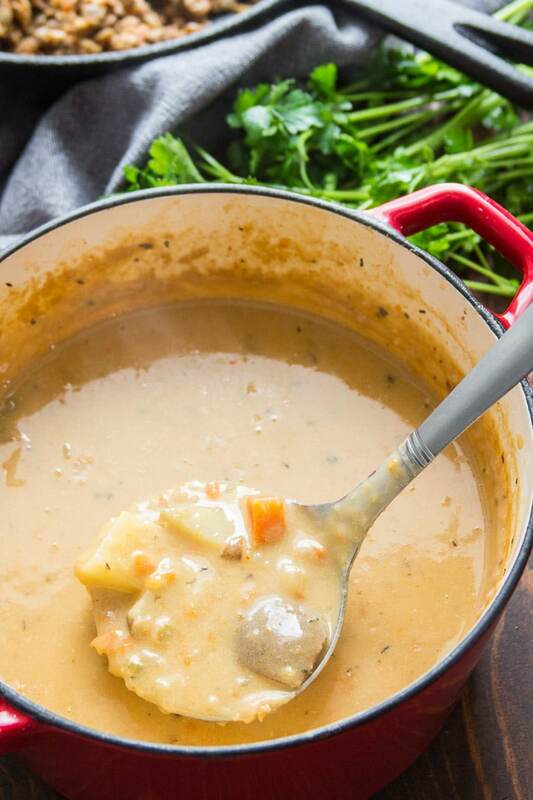 Make this cozy soup for dinner tonight. I just recently learned that cheeseburger soup is a thing. My first thought: “That sounds so gross on so many levels.” My second thought: “I should totally make a vegan version of that!” Somehow this all makes sense in my world. 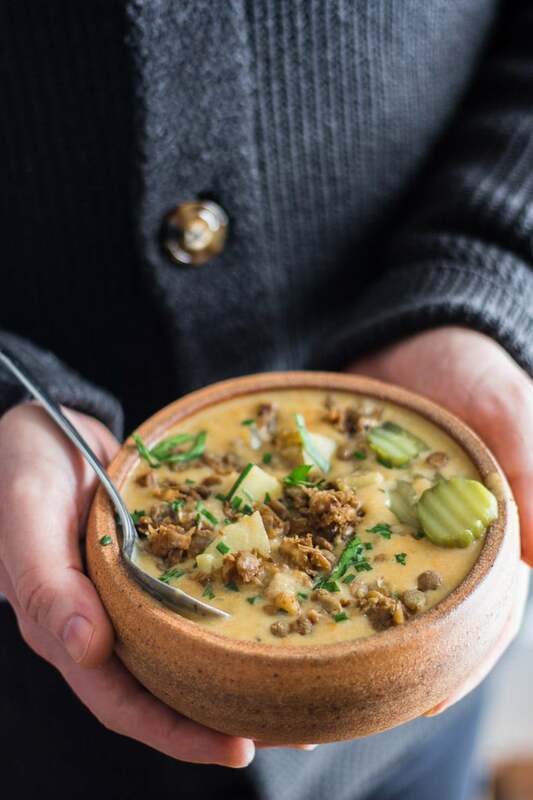 There are bunch of versions of cheeseburger soup out there, but they all basically consist of a cheesy soup with potatoes, sometimes carrots and celery, and ground beef. It’s one of those dishes that sounds really weird, but people claim will blow your mind once you try it. I can’t really confirm whether that’s true when it comes to conventional cheeseburger soup. 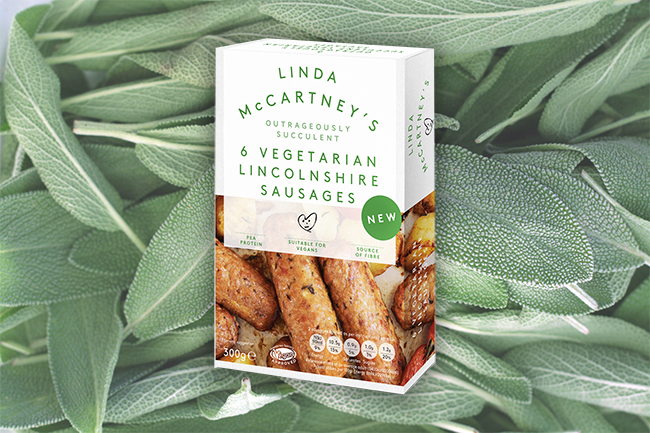 But I do think it sounds pretty weird, even (and maybe more so) in vegan form. And I can confirm that my vegan version was pretty amazing. And weird too! And yes, the soup is strangely cheeseburgery. My vegan cheeseburger soup starts a lot like regular cheeseburger soup. First, cook up some celery onions and carrots in some oil. Once they soften up, add some garlic and flour. Cook the veggies a minute more and add some coconut milk, another non-dairy milk of choice, and bullion. Yes, bullion. I usually use veggie broth in my soup recipes, but this one needs a good amount of non-dairy milk to get it as rich and creamy as dairy-based cheeseburger soup, so we’re using bullion (I actually used Better Than Bullion — Seasoned Vegetable Flavor) to add the flavor you’d get from broth. Stir in some seasonings — thyme along with nutritional yeast, hot sauce and mustard, all of which make the soup taste cheesy and burgery. Add some potatoes and simmer. Once the potatoes are soft, blend some of the soup with an immersion blender, or in a separate blending device. 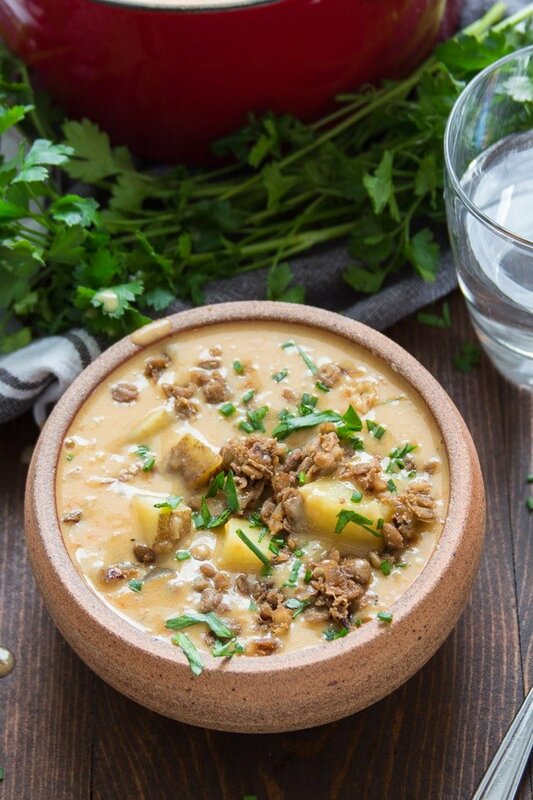 The burger part of the soup is made from lentils and walnuts, and you’ll be cooking it while the soup simmers. Sauté an onion in some oil, and make sure you let it brown a bit when you do. Add some garlic, followed by lentils, seasonings, and finely chopped walnuts. You can mash some of the lentils with the back of a spoon if you want the mixture to be clumpy. Ladle the soup into bowls and layer it with your lentil cheeseburger crumbles. Top your soup with just about anything that would go on a burger. I opted for pickles, chives and some parsley, but fried onions, coconut bacon (for bacon cheeseburger soup) or homemade croutons made from sesame seed rolls would be great. Make sure the non-dairy milk you use is unsweetened and unflavored.Otherwise the soup will taste weird! It should also preferably contain minimal additives and thickeners. I really like Milkadamia and WestSoy’s unsweetened varieties for creamy vegan soups. Does the coconut milk make the soup taste like coconut? I couldn’t taste the coconut at all. Yeah, but I really hate/am allergic to coconut. Is there a substitution? You can probably get away with just using an extra 1 3/4 cups of whatever other variety of non-dairy milk you’re using. Coconut milk adds a good amount of fat though, so the soup won’t be quite as rich. Can this recipe be made gluten-free? Maybe. The flour serves as a thickener, but so do the blended up veggies and potatoes, so you might be able to increase the amount of those ingredients and blend up more of the soup after it’s cooked. I’m allergic to walnuts. Is there a substitution? Pecans might work, or you could just leave them out — they add texture but aren’t absolutely essential to making the recipe work. Does the hot sauce make the soup spicy? Just a tiny bit! But it also makes it taste cheesy, so I don’t recommend skipping it. If you’re nervous, try adding the hot sauce at the end of cooking, just a bit at a time. And if you use less than the recommended amount, consider adding a splash of vinegar to the soup as well. Begin by making the soup. Coat the bottom of a large pot with oil and place it over medium heat. When the oil is hot, add the onion, celery, and carrots. Sauté for about 10 minutes, until the veggies begin to soften up. Add the garlic and flour. Stir well to coat the veggies with flour and sauté for about 1 minute, until the garlic becomes very fragrant. Stir in the coconut milk, non-dairy milk, water, potato, bullion, nutritional yeast, hot sauce, mustard and thyme. Raise the heat and bring the liquid to a simmer. Lower the heat. Allow the soup to simmer for about 20 minutes, until the potato is tender. While the soup simmers, prepare the cheeseburger crumbles. Coat the bottom of a medium skillet with oil and place it over medium-high heat. When the oil is hot, add the onion and sauté until the onion begins to brown, about 5 minutes. Stir in the garlic and sauté for about 30 seconds more, until very fragrant. Stir in the lentils, walnuts, soy sauce, Worcestershire sauce, cumin and red wine vinegar. Continue to cook for about 3 minutes, until most of the liquid has dried up. 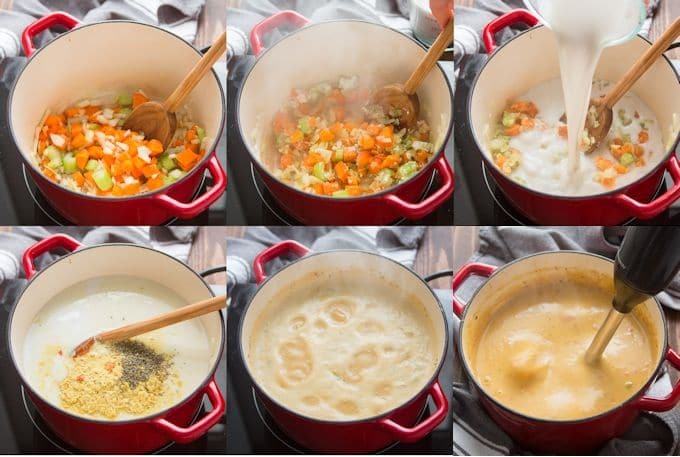 When the soup has finished simmering, remove it from the heat and use an immersion blender (or food processor or regular blender) to blend 1/3 to 1/2 of the soup (blend as much as you need to reach your desired thickness). Season the soup with salt and pepper to taste. Adjust any other seasonings to your liking. 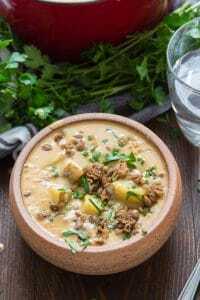 Ladle the soup into bowls, layering it with the lentil walnut burger crumbles. Top with toppings of choice and serve. 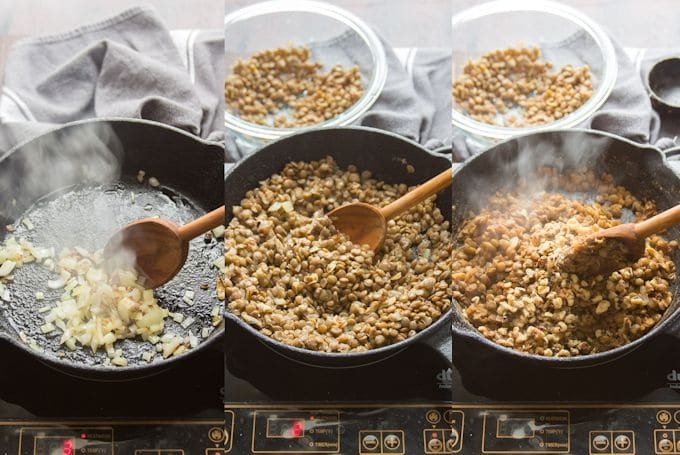 To cook dried lentils, place 2/3 cup of lentils in a saucepan, cover with a few inches of water, and boil until the lentils are tender, about 25 minutes.Nutrition FactsVegan Cheeseburger SoupAmount Per Serving	(1.5 cups)Calories 494Calories from Fat 257% Daily Value*Total Fat 28.6g44%Saturated Fat 15g75%Sodium 485mg20%Potassium 980mg28%Total Carbohydrates 40.6g14%Dietary Fiber 13.7g55%Sugars 6.9gProtein 16.1g32%Calcium17%Iron27%* Percent Daily Values are based on a 2000 calorie diet.